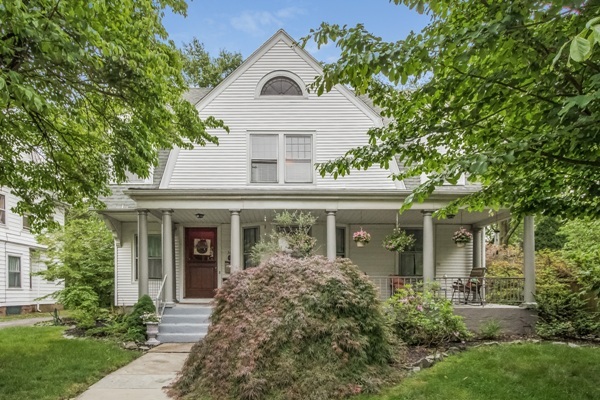 Welcome to a grand West End Victorian with outstanding architecture and unique spaces. Relax on the covered front porch, where you can greet your neighbors as they walk past. A dark wood door and double entry leads to the oversized foyer, with tile fireplace and built-in bench, which is the heart of a home. Columns separate the formal living room from the foyer. A pocket door opens to a den with built-in shelves and French doors out to the rear deck. The foyer is also open to the formal dining room, which connects to the kitchen via the butler’s pantry with wet bar. The kitchen is fully updated with stone counters, 6 burner Viking range, SubZero fridge, and apron sink. There is counter seating, and also space for a small table. A mudroom leads out to the deck, and an updated powder room completes the level. Upstairs, the master bedroom has a large walk-in closet with laundry. The main bathroom has been updated with double sinks and an oversized shower. There is a large family room with tile fireplace, and a spacious guest bedroom. The final bedroom on the level opens to a balcony along the back of the house overlooking the yard. The top level has flexible space with a bedroom, sitting room with counters and sink, and a cozy bonus room in the home’s front gable. There is an updated full bath. Outside, the multi-level deck has room to relax and to entertain. The fully fenced back yard is landscaped with paths and mature plantings. There is a storage shed and off street parking. 36 Oxford Street is offered at $335,000. If you’d like to see this property, please have your agent arrange a showing or call me at 860-655-2125 to schedule a visit. More details and a photo tour are available. Would it be effective to market a home using black and white photography? 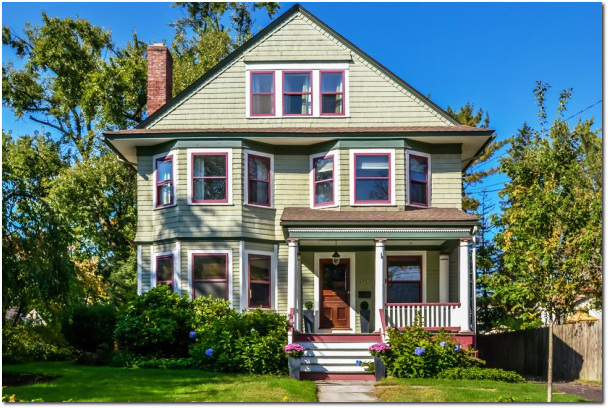 All of the homes currently on the market feature color pictures in their listings, both in the MLS and in the miriad of consumer real estate websites. A property without color photos would stand out from the others online. What’s not clear is if the impression it makes would be a positive one. My first experiment with black and white was a failure. Removing the color from the professional pictures of one of our listings was unsatisfactory. The collection of photos felt more like a time warp than a unique spin on real estate photography. I don’t think anyone aspires to live in the black and white era of the early twentieth century. For my second attempt I decided to take a new set of photos at a different property. I chose an 1890s Victorian home that has an overabundance of architectural details, thinking that the woodwork would be the focus of the pictures. Here are two of those shots. What was interesting about this attempt was that my opinions about which photos were “best” changed once they were converted. The most compelling color shots where not the ideal black and white shots. Removing the color takes away an entire dimension, increasing the importance of other aspects of the pictures. I found myself appreciating the effect of shadows, which create exposure problems in color photography. And there was one shot (the second one shown above) where the disorder and complexity of a series of open doors was more interesting than the simplicity of the same shot in which all the doors were closed. I don’t think I have the eye to make an entire home compelling in black and white yet. However after just two experiments, it does seem like there is an opportunity to show a unique side of real estate by photographing it without color. 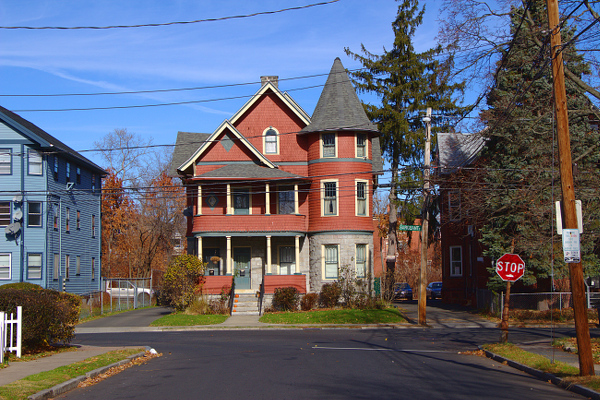 The housing stock in Hartford has examples of both towers and turrets. People seem to use the term “turret” to describe small rooms that stick up from the rest of the building and have their own roof. Sometimes they’re right, and sometimes they’re wrong. I’ll admit to sometimes getting it wrong before I looked up the definitions. Most of the time people are talking about an architectural feature that should be called a “tower,” since they are far more common. The difference between the two is in their base – how they connect to the building. Towers go all the way to the ground, and have their own foundation. Turrets emerge from the building part way up, hanging over empty space below. Turrets are less common, but there are some examples in the area. 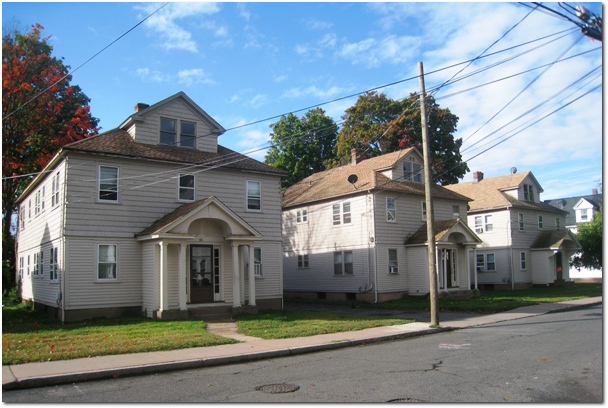 The other day I was in the Asylum Hill neighborhood and saw three homes with towers on the same street. Two were round with conical caps on the top, while the third looks to have 7 sides (odd, I’ll have to go back and confirm). 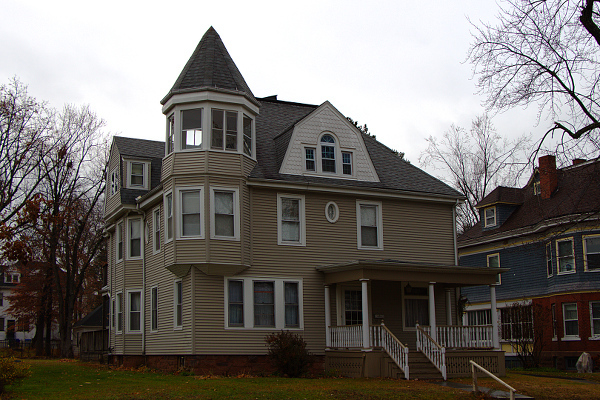 Here is a picture of a turret in the West End neighborhood. In this case the feature begins on the second floor of the home, but still extends upwards beyond the roofline. Don’t miss this West End gem! Welcome home to a classic Victorian with amazing architectural details, all in excellent condition. 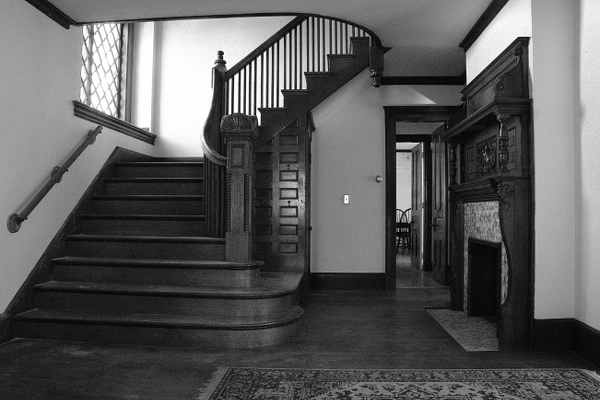 The front porch invites you up to the main entrance with a paneled original door. Inside, an open foyer greets you with a comfortable space that includes intricate natural woodwork. 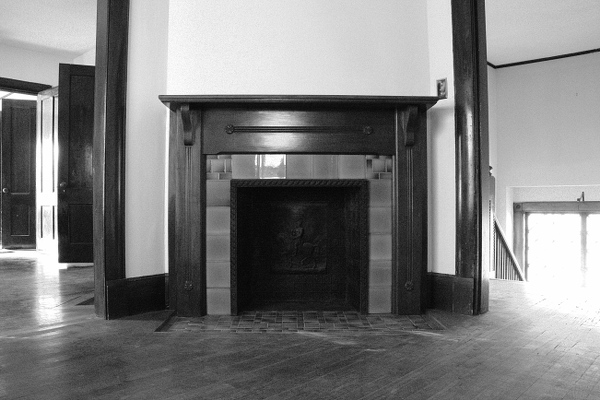 The living room features an ironspot brick fireplace and the first of several bay windows. A built-in cabinet and stained glass window anchor a large dining room that leads to the kitchen through a pantry with working original sink. The kitchen has been updated with granite counters, stainless steel appliances and radiant floor heating. Continue outside to a partially covered rear deck with plenty of room for a grill. The deep yard is partially fenced and landscaped, and the home has a 2 car garage. The second floor has four bedrooms off a central landing and an updated full bath. The three larger bedrooms each have bay windows that give them a bit more space, light and character. The third floor features two more bedrooms and an updated full bath off another generous landing. Take over the whole floor as the master suite or give your guests a large and comfortable space when they visit. The boiler, hot water heater and roof of the home have all been recently replaced. 141 Kenyon Street is offered at $395,000. If you’d like to see this home, please have your agent arrange a showing or call me at 860-655-2922 to schedule a visit. More details and a photo tour are available. 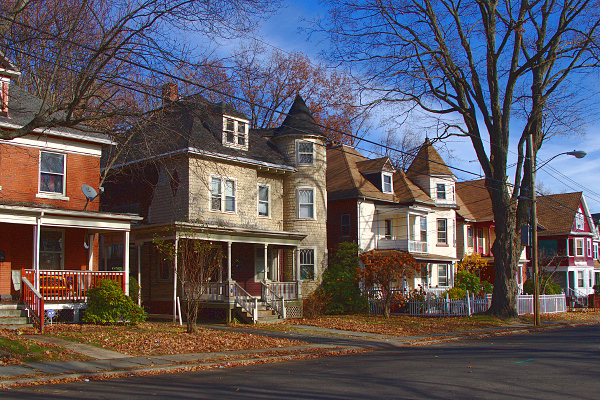 These three homes caught my eye because they looked so similar. Not identical, but pretty close. Standard floor plans and cookie cutter homes are not so unusual these days, or even during the post-war build-out of the country’s first suburbs. But it is less common to see three adjacent homes built in the early 1900s look so similar, even down to the same color scheme. It turns out that all three structures are on a single lot. There is actually a fourth multi-family home behind the one on the left, and some garages along the back of the property. I’ve seen similar homes spread throughout a neighborhood or town, but don’t ever remember seeing this before. I’ll have to be on the lookout for other examples of repeated designs in turn of the century homes.